The brand is working with video advertising platform Good-Loop to deliver video advertising in a way that also generates charitable donations from the company. Good-Loop describes itself as an “ethical online video advertising platform seeking to fix the problems experienced in ad tech”. The partnership with Knorr was forged though the Unilever Foundry, the FMCG company’s start-up incubator programme. 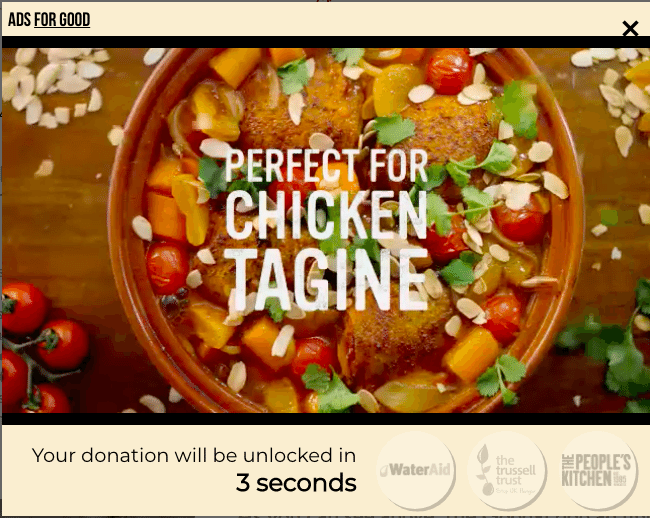 Viewers who watch a Knorr advert for 15 seconds are then ‘rewarded’ with the option to choose one of Knorr’s charitable causes to receive 50% of the ad money. The three charities are The People’s Kitchen, The Trussell Trust and WaterAid. They were chosen because they matched Knorr’s “wider commitment to make sustainable living commonplace”. The rest of the advertising income is split between the publisher and Good-Loop as income. The pilot will last four weeks in April, with Knorr Chicken Stock Pot’s and Beef Concentrated Stock adverts running across a range of UK-based online publishers. The trial is an attempt to achieve improved levels of engagement and give consumers the opportunity to make a positive impact on society. For Knorr, the cost-per-play for each ad is lower versus a standard video ad. Already, it claimed to be seeing a rise in engagement rates, completion rates and click-through rates versus a normal video ad campaign. Publishers will earn less per ad than they would a standard video ad format, but those that have signed up to the Good-Loop model include the Guardian and Stylist among a number of other premium publishers.